Public relations is an important aspect for brands. The idea that press releases are all there’s to it still lives on today among many businesses, but that couldn’t be more far from the truth. Sure, press releases are still an important part of it, even though they were more important back in the days, because now you have new tools to manage your public relations. The idea behind PR is essentially getting as much positive coverage on your company as possible and as often as possible. And with social media, this can be done on any given time, in a way that people couldn’t believe would be possible back in the days. With social media playing such an important role in most people’s lives, and giving you the ability to reach billions of people at once, social media should also play a central role in your PR efforts. As a brand, it’s important to be agile and ready to adapt to new trends and changes in the business society. PR was once circulating almost solely around news networks and newspapers, but now, you have social media, bloggers, podcasters, and much more at your disposal. The result is that much of brands’ PR has moved to the huge platform of social media. In this post, I’ll be presenting 5 ways to use social media for public relations. A common PR strategy that many PR teams use is to share case studies to highlight how well their brand/product helps people reach their goals and achieve results. The most common form of presenting case studies is via text. Unfortunately, this is not always the most effective way to spread the message. In fact, 55% will read a blog post for 15 seconds or less. (Thanks for sticking with me). Not good if you’re looking to get your message through, and ultimately impact them. What works even better than text is visuals. Did you know that 90% of the information transmitted to the brain is visual? 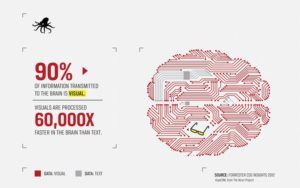 Did you also know that images are processed 60,000X faster than text? You know that a picture says more than a thousand words, so why not use them? Or even, better, why not use videos? For a camera filming in 60 frames per second, that’s 3600 pictures per minute! Imagine the power to convey a message and the impact you can make using visuals! Both video and photos can be shared on social media, and you’d be a fool if you didn’t use it. Yes, just because you share a video or a photo doesn’t mean that you should neglect writing a caption. This is especially important for images, since captions help add context and information around the image. If you’ve done a video dedicated to testimonials, adding a caption is helpful, but not vital. Especially not if you’ve added sound in the video, for example someone telling a story, or people being interviewed. Microsoft created a testimonial video focusing around storytelling, and retelling the story of Sarah Churman who has been deaf all her life, but with the help of Microsoft’s technology becomes able to hear for the first time. Microsoft decided to make a video rather than to write an article because they have a completely different opportunity to affect the emotions of the viewers and play on their feelings. Microsoft then shared the video on different social platforms YouTube as the main platform and saw tremendous success from it. Different from press releases and similar PR techniques, social media allows people to share and spread your very own message, allowing it to gain traction and work as a form of marketing for your brand. All of this in a way that wasn’t possible before social media. Another way to present testimonials is to create appealing infographics, combining text and visuals. We’ve already spoken about how you’ll be far better off sharing testimonials through visuals, and converting your testimonial text into videos or infographics, but we’ve not yet covered what your approach with PR should look like. The traditional way of sharing a press release is to send it to your email list, (possibly) share it on your blog, and finally reach out to a few journalists. The only problem is that so is hundreds of thousands, if not millions, of other brands. Well, first of all, most people you send your press release to probably won’t read it. When it comes to the journalists, the sad reality will be quite similar in most cases. Unless you have something extravagant that will revolutionise the world, or interest a ton of people, the odds are that they’ll read the first few paragraphs and click backspace. Think about it: journalists are busy people who get bombarded with emails all day long, and they develop the ability to sort out the irrelevant from the interesting. Not to sound harsh, but in many cases, your press release won’t end up in their pile of “interesting”. Does this mean that you should completely ignore traditional press releases? Absolutely not! Press releases still work really well for the brands who are doing it the right way. It means that you should extend the reach and the life length of your press release with the help of social media. Now, all social platforms work differently, and therefore, you need to have different strategies for each and everyone of them. For Twitter, for example, your best bet is probably to share the link of your press release and direct your followers back to its source. If you’ve decided to spice things up and make your press release in video format, then, of course you should share it on YouTube or any other platform that is dedicated and suitable for video content. Most people don’t want to read a full-page of text. Especially if it’s not a text about something they’re deeply passionate about. As I mentioned earlier, most of the time, a press release won’t be part of their deep passions. By making your press releases more appealing and easily-digestible by coming up with new ways to convey your message, and then sharing them on social media, you’ll have more people reading them, and more people becoming interested in whatever you’re informing people about. 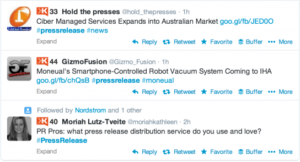 What you also want to do is make your press releases social friendly. This does not necessarily mean that you should change the structure or nature of your press release. It just means doing something as simple as adding social sharing buttons next to your press release, allowing people to easily spread it to their peers. I hate to repeat myself, but I wouldn’t do it unless I believed it would be important. If you want people to share your content, you are going to have to have to do a little work to your press release. Again, not surprisingly, visuals have a huge effect on social shares. In fact, photos accounts for 87% of the social shares on Facebook. What’s more, posts that include images produce 650 percent higher engagement than text-only posts. I talked about the fact that journalists receive a ton of press releases in their email inbox every day. Well, you’re not exactly unique. In addition to that, you also need to have in mind that journalists are people too, and when you approach them, you need to approach them first and build a relationship with them, before asking for anything in return. It’s about first providing value before asking for anything. Cold-calling works sometimes, but I promise you, you’ll be far better off by building long-lasting relationships with journalists rather than cold-calling them. That way, you’ll be able to reach out to them at any give time with your press releases and be fairly sure that it will be reviewed. But first, you need to provide value, and build relationships with them. Just like with a customer, you need to build up trust. And what better place to do so on than social media? The same principles for building relationships with journalists as customers applies, and hopefully, by now, you should have mastered the art of providing value to your customers before you ask them for something (Jab, jab, jab, right hook). Therefore, I won’t go into the nitty-gritty of relationship building on social media. First, start by sharing the journalist’s articles and posts every now and then to show your support and get their eyes up for you. When sharing, make sure that you are mentioning them so they can see it. Secondly, you want to engage with the content of the journalist. Whether it be a blog post online or them asking a question on social media, make sure you are there to engage with them and add value to the discussion. Last but not least, avoid being promotional. Instead, focus on speaking to them in a personal and conversational tone. It’s difficult to protect your reputation, and whether you like it or not, there’s a risk that you’ll face a crisis, scandal, or social media storm. Whether you are receiving bad or good press, your public relations strategy need to tell you exactly how you’re going to handle a crisis when it occurs. When struck by a crisis, you don’t want to stand there without a plan on how you’re going to solve the situation in the best possible way. In worst case scenario, it can make you act out of desperation, leading to even worse attacks against your brand. Take United Airlines for example. United faced huge turbulence on social media after having to “re-accommodate” a passenger of an unbooked flight. The re-accommodation was more or less an assault, dragging out the passenger that refused to give up its seat. Of course, the complete event was captured on film and went viral soon after. While United has a particular social media team, they didn’t have a strong plan on how they would handle a crisis of this size on social media, and the criticism against the brand was huge. 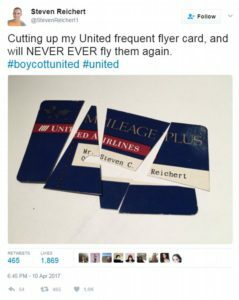 The hashtag #BoycottUnited started to circulate, now boasting over 4000 posts. Huge celebrities also took it to social media to express their anger towards the airline. Public relations are an important part of any successful brand. The public is your customers, and if you don’t inform and engage with them, you’ll have a hard time spreading the word about your business and getting the right kind of exposure for your brand. Today, brands have social media at their disposal for managing public relations. A tool that you can’t afford to ignore.